The new Bushy’s TT Village is open and fans are flocking to the new site at the Villa Marina Gardens to check out the new home. Bathed in sunshine, the gardens form a backdrop to a bona fide festival which offers artisan food units, pop up craft stalls, a gin bar, wine bar as well as the island’s biggest pub bart stocking all the usual Bushy’s TT favourite beers as well as local ciders and other drinks. 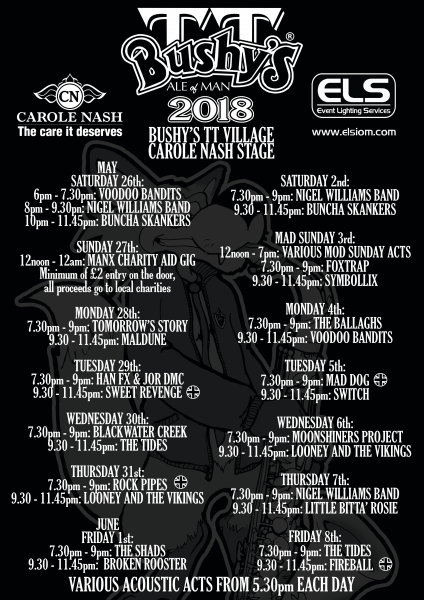 The Carole Nash Music Stage music has been rocking since we opened with the cream of the island’s musical talent strutting their stuff, and all this for NO ENTRY FEE! !